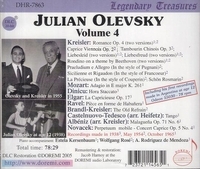 "Olevsky made his recital debut at 10 and his orchestral debut at 12 under the baton of Fritz Busch. He became an American citizen in 1951. In 1967, he was appointed Resident Artist and subsequently Professor of Violin at the University of Massachusetts. The eminent violin critic Henry Roth called Olevsky 'a brilliant virtuoso, a fine tonalist with glowing temperament and a tasteful musician and stylist'."